In recent time, the question of "where to find data?" is no longer a big concern. Another bigger issue has emerged, which relates to "what sort of information that can be extracted from data?". Storing raw data as files in hard disks or storage media is also no longer fashionable because "we don't have to do it, all of them are in the cloud now". A few lines of codes below demonstrate how to use Google Earth Engine to find and extract information from cloud storage (by Google) and show them in the way you like. Of course, if you're good enough at Java programming, you can manipulate and analyze this data and turn it into more valuable information.... in a flash. 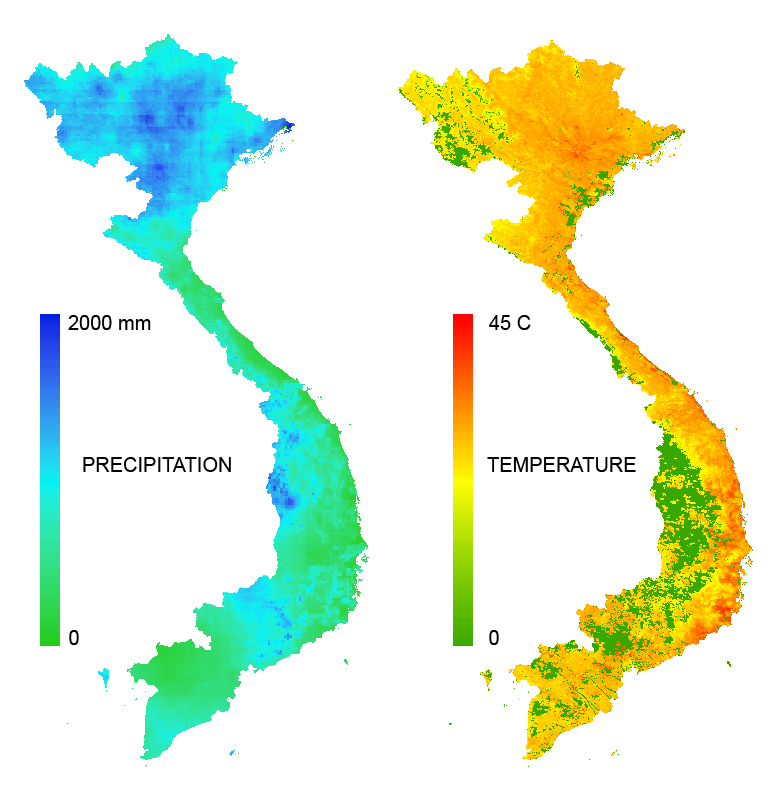 The codes work in a few seconds to acquire, select and display monthly average temperature, plus accumulated rainfall across the country of Vietnam. You can modify desired time period to get more data if you wish. My codes are free. To run codes, you need to register an account with Google Earth Engine. For ones who do not have GEE's account, see the outputs below. Google Earth Engine does not support to embed data and interface into other web applications. You may need to go around with some Python codes. See this example for demo: https://github.com/google/earthengine-api.